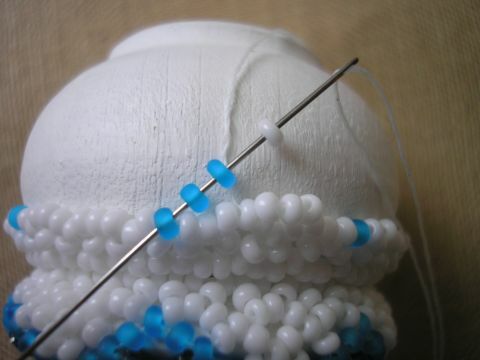 'll Braid casket. 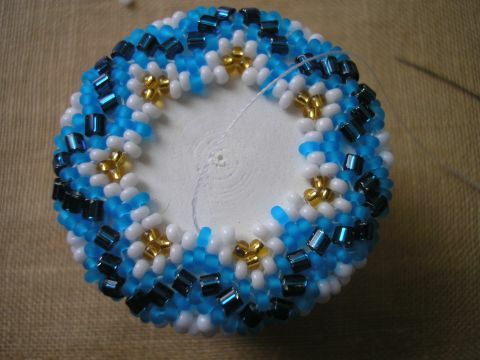 Master class turned out great, so do not blame me. 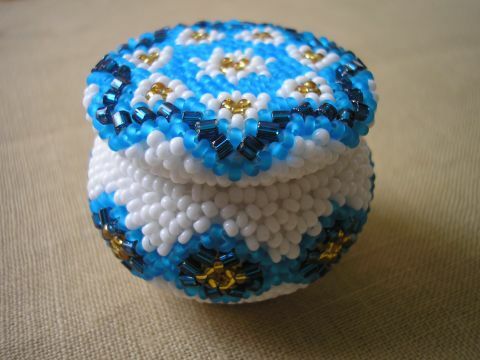 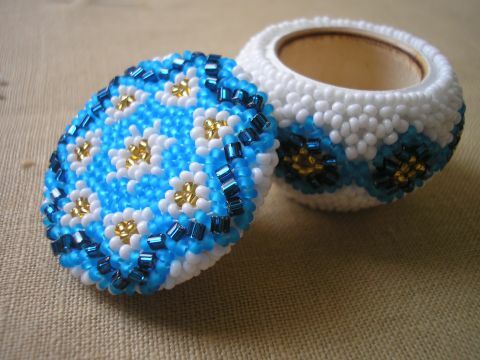 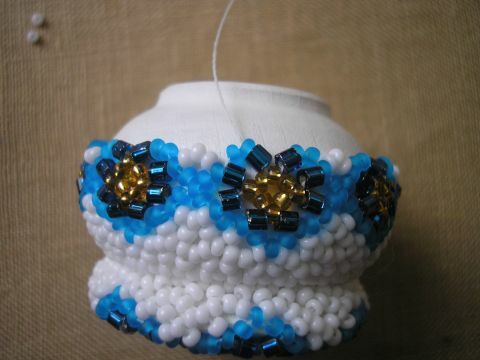 Casket 4 cm in diameter, number 11 seed beads Czech Republic. 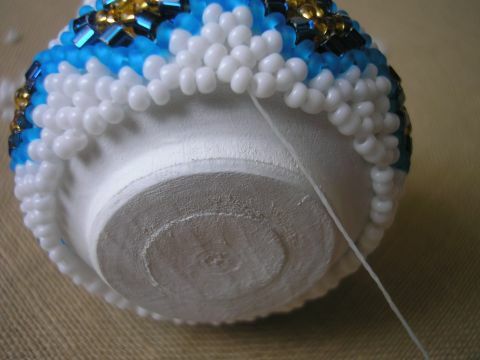 Making the cap work only with a closed casket. 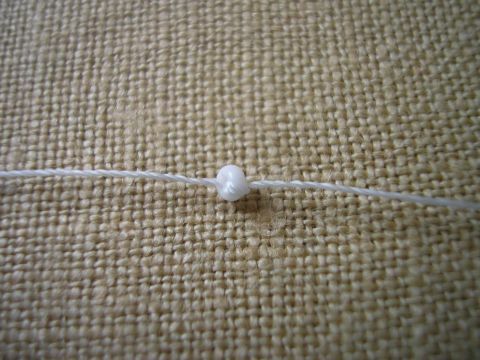 Anchoring beads on a string first. 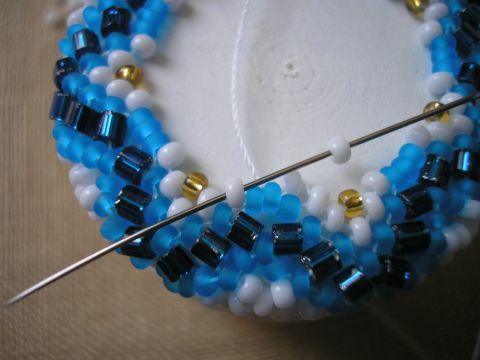 Recruit a number of beads to be divisible by three. 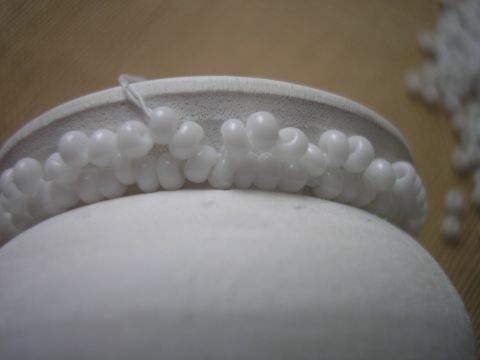 In this case, scored 63. 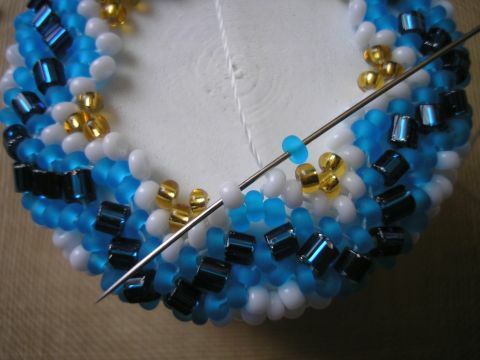 Closable vkrug and pass again through all the beads. 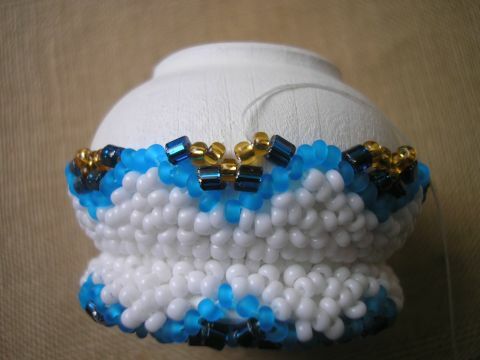 We must get out of the second bead. 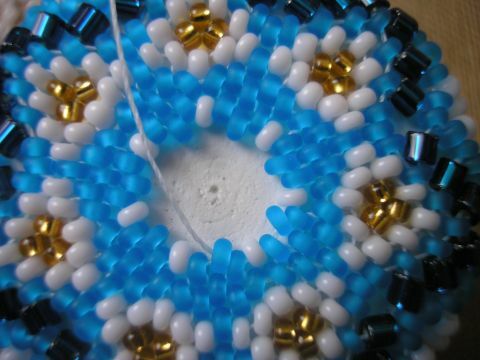 Work only with closed caskets. 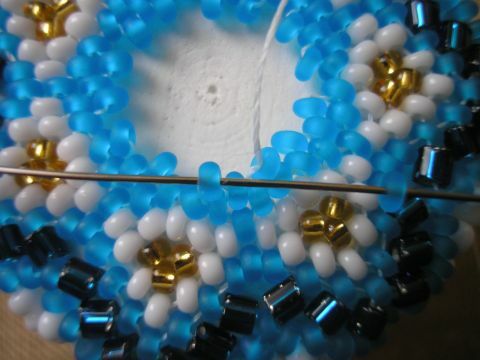 Puts on casket our circle of beads. 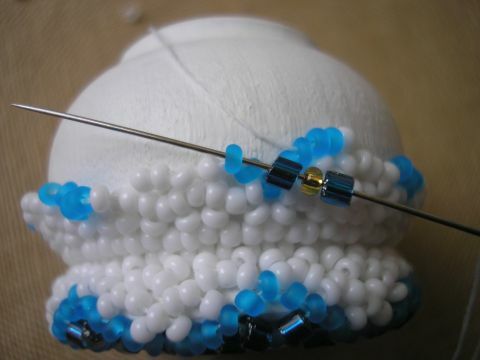 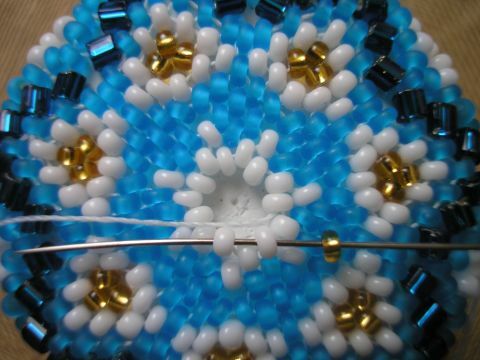 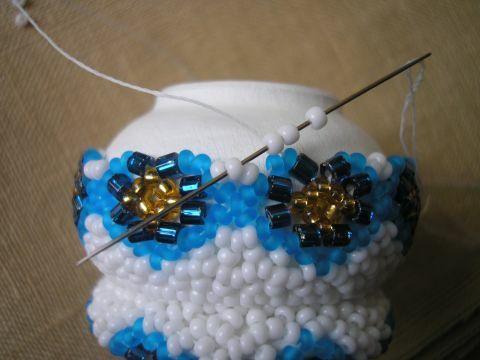 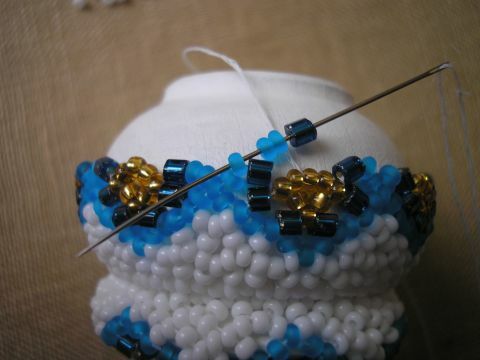 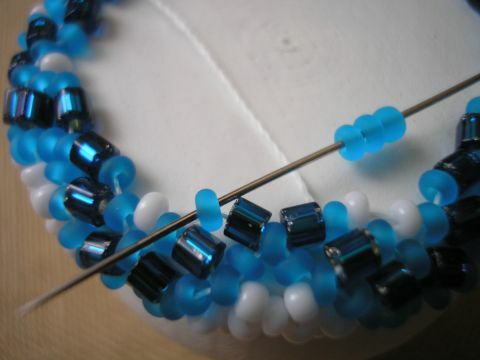 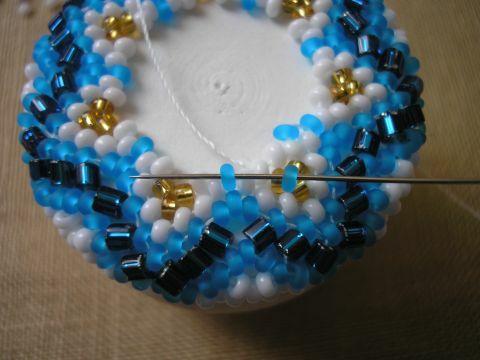 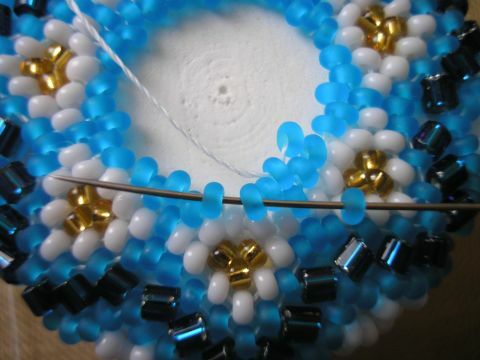 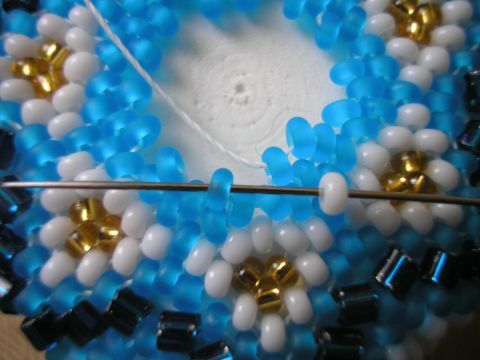 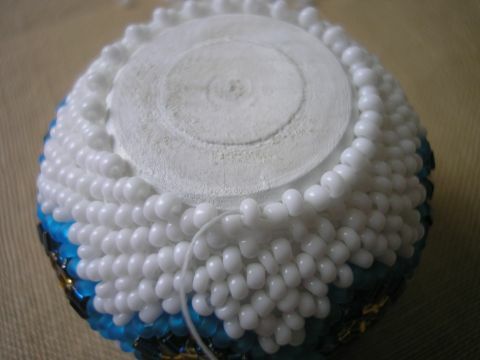 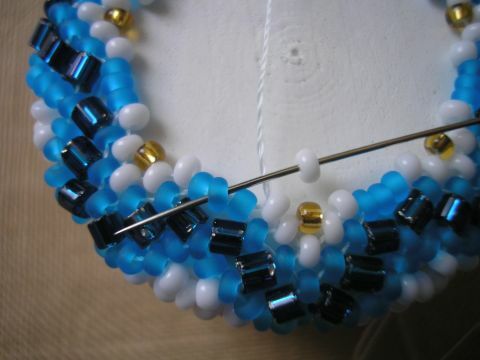 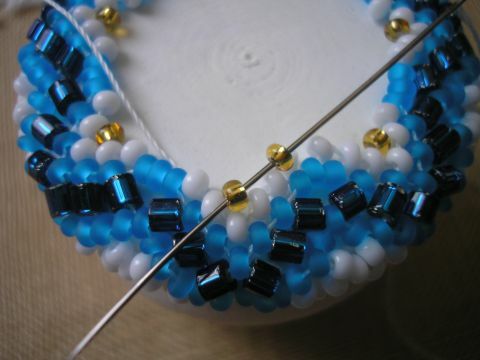 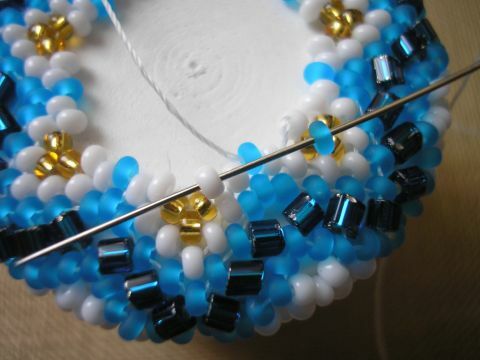 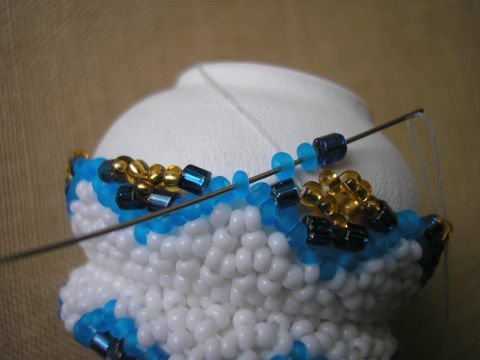 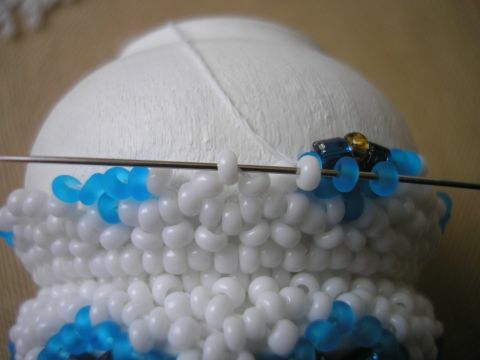 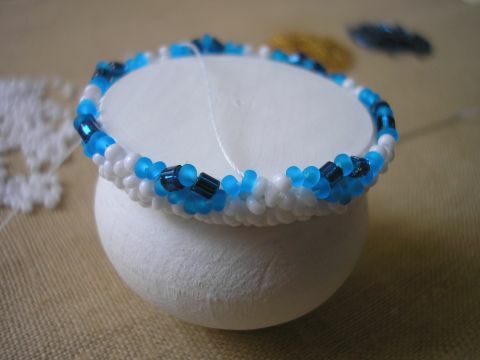 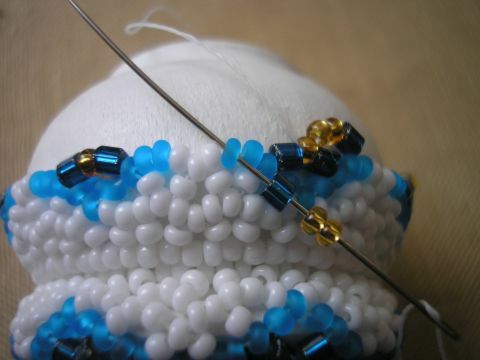 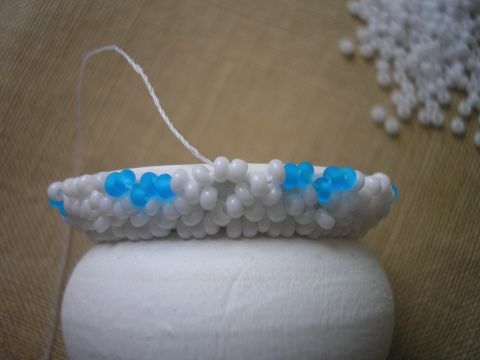 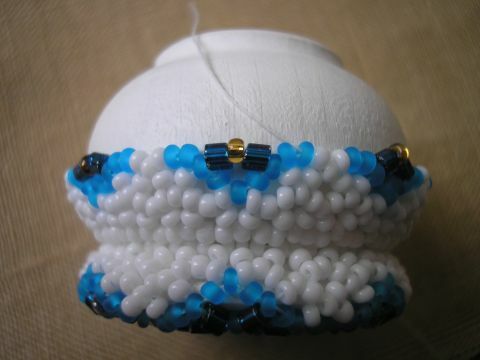 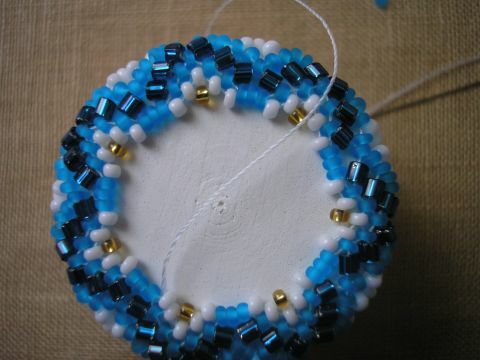 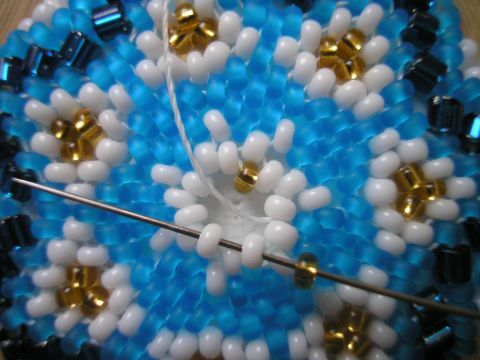 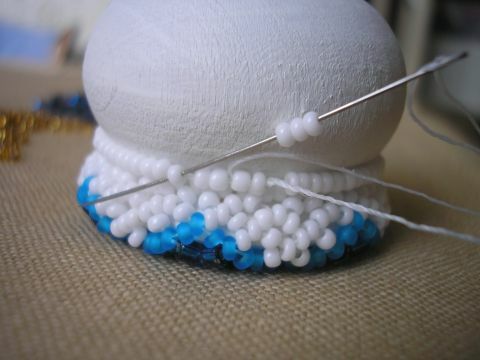 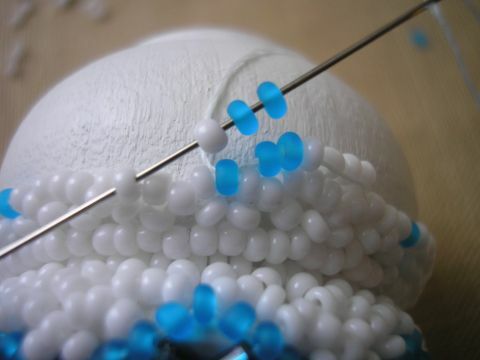 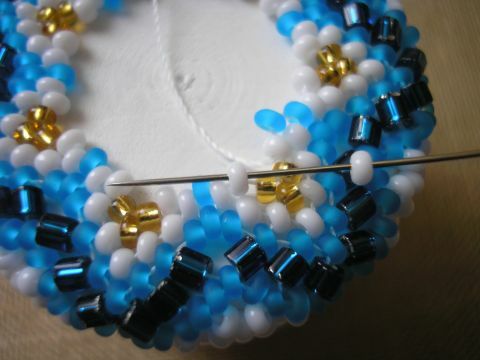 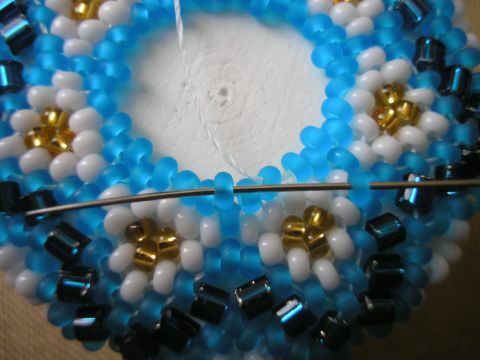 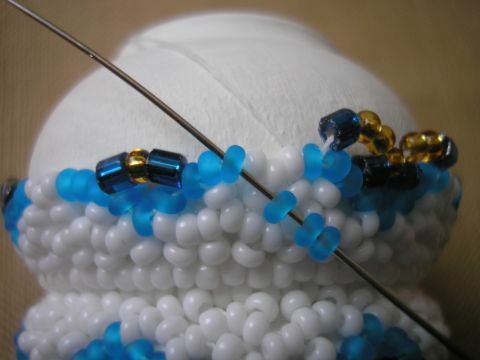 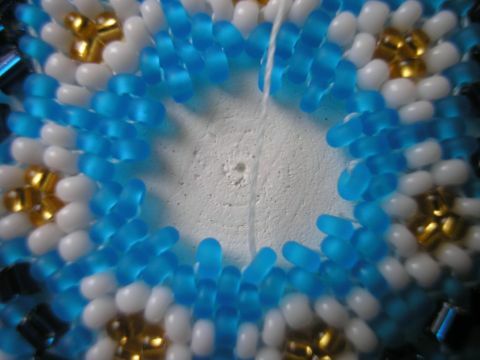 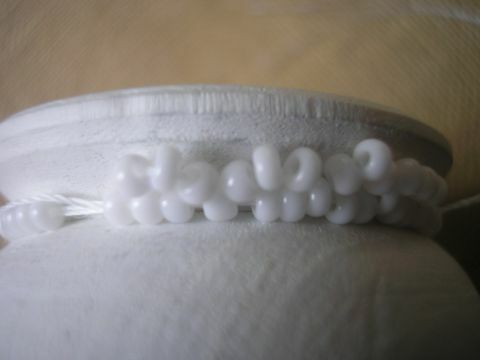 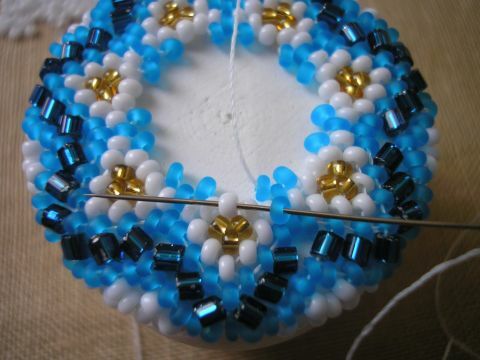 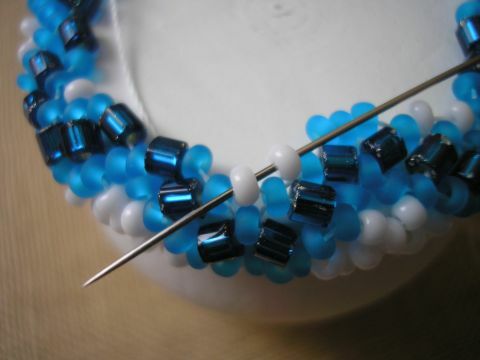 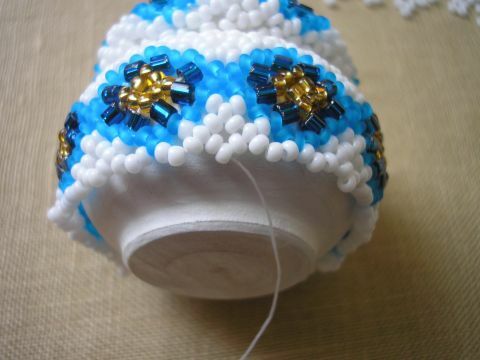 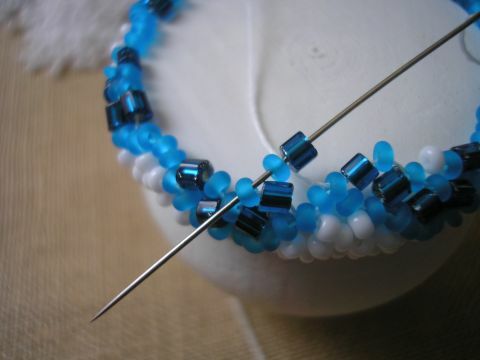 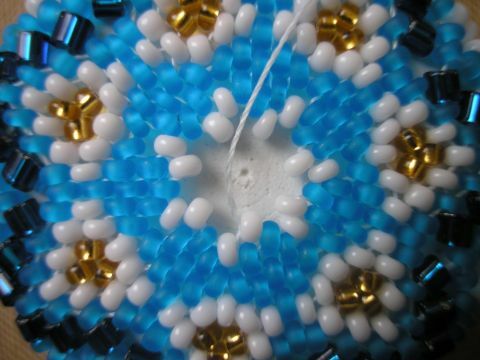 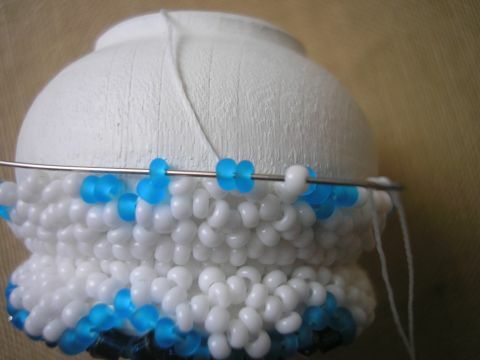 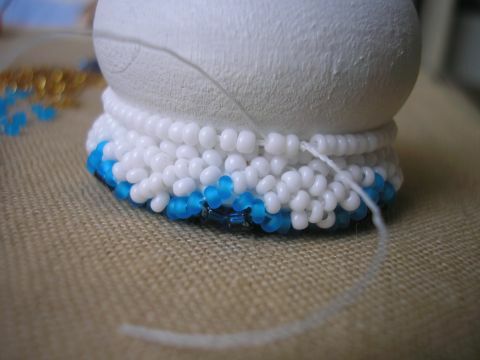 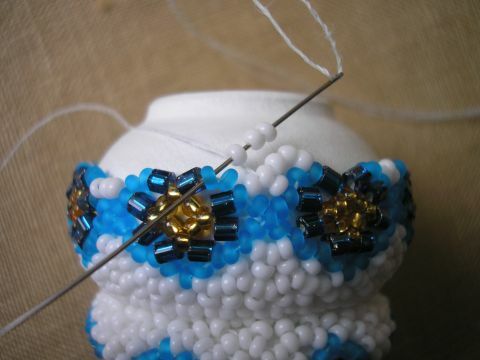 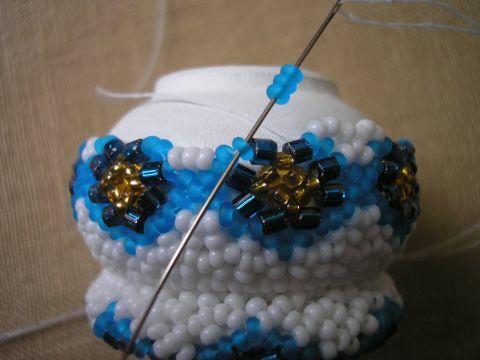 Tightens the thread and beads to densely sat on the casket. 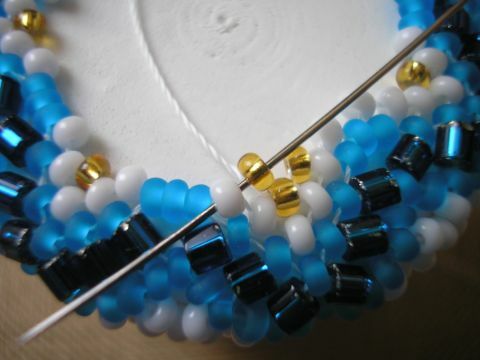 Dial three beads, enter the third, etc. 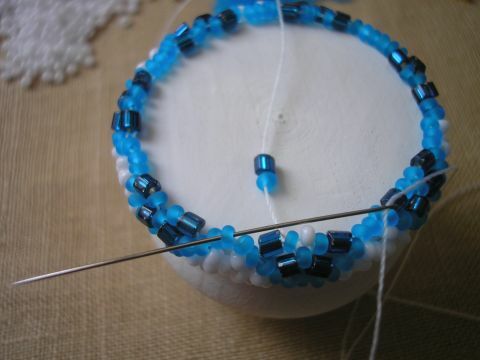 Completed the first series, and brought up a thread from the middle of beads. 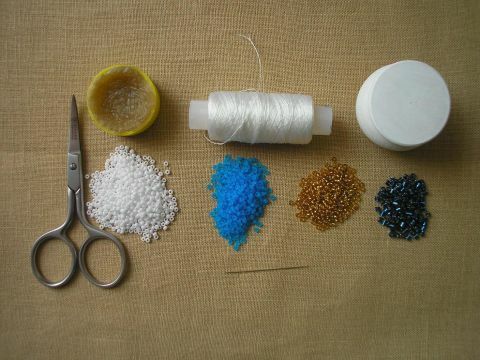 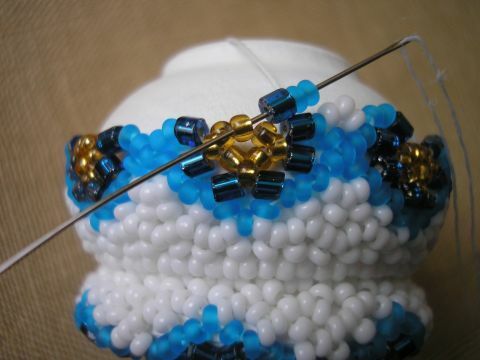 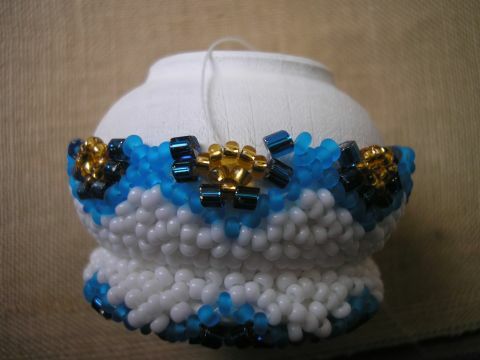 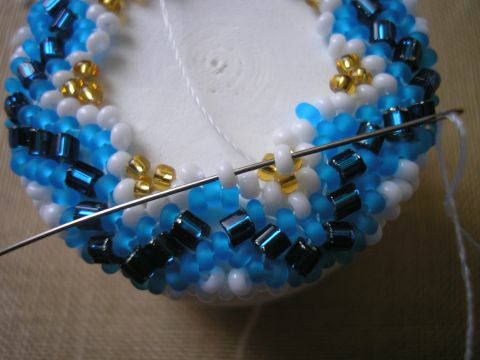 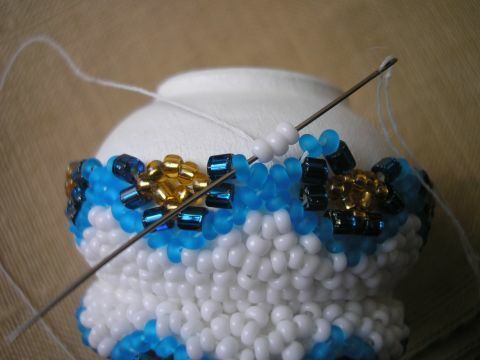 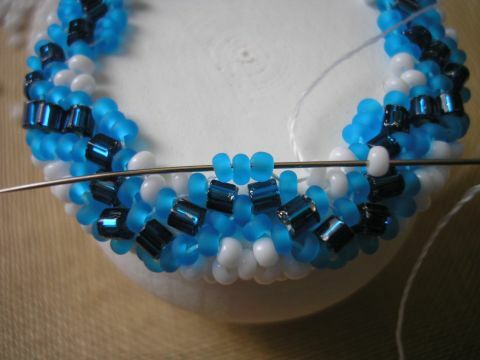 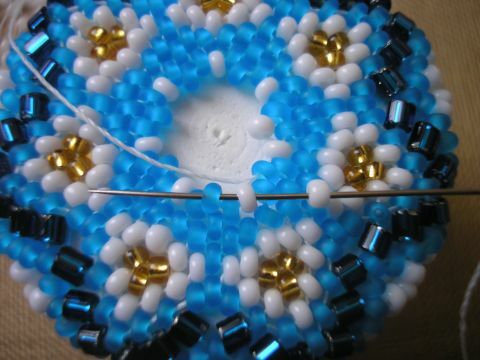 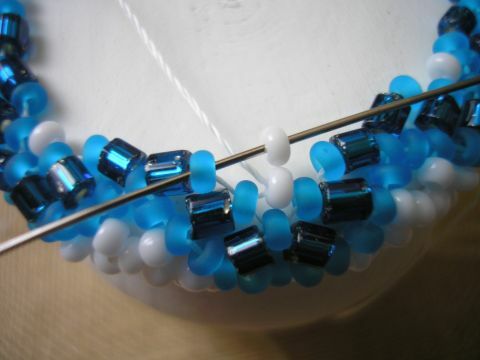 Further include beads of another color. 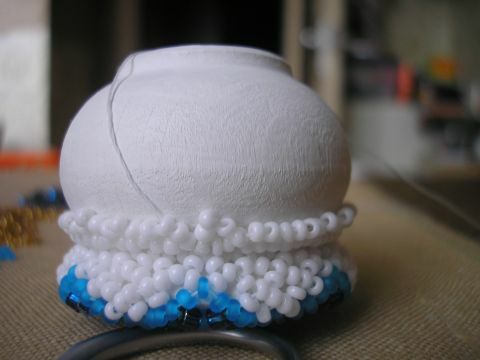 1 white 1 blue 1 white, 3 white, 3 white and so on until the end of the series.Here's what happened. 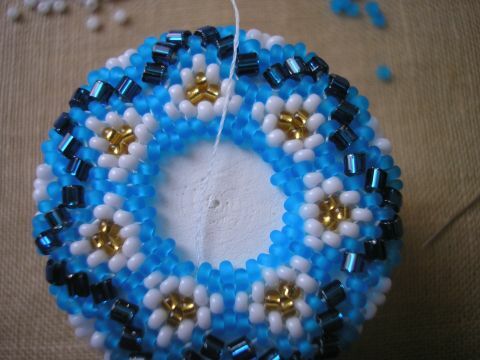 3 white, 1 white 2 blue, 2 blue 1 white and so on until the end of the series. 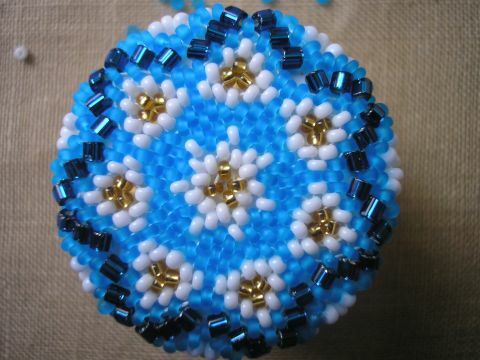 1 white 2 blue, 1 cabin 1 blue one cabin, 2 blue 1 white and so on until the end of the series. 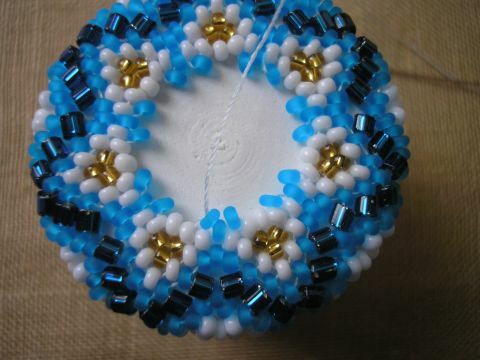 1 cabin 1 blue, 1 blue one cabin, 3 blue, and so on until the end of the series. 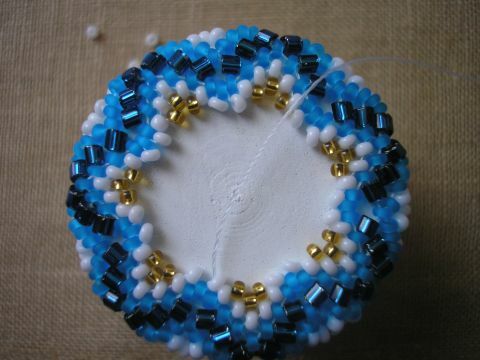 1 cabin 1 blue and so on until the end of the series. 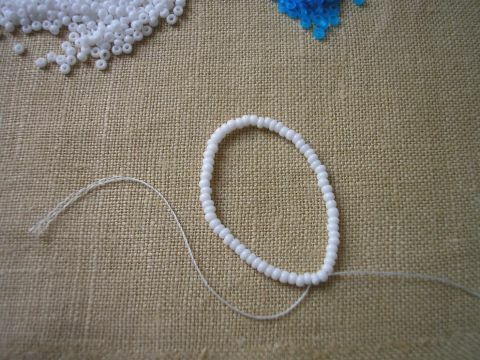 1 white and so on until the end of the series. 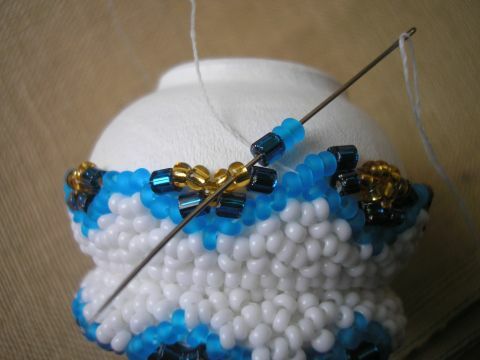 1 gold and so on until the end of the series. 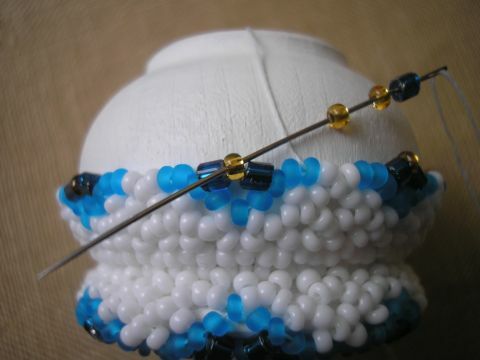 Since the end of the series. 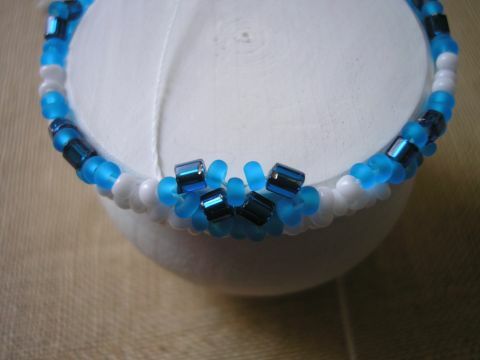 The full range of typing on a light blue. 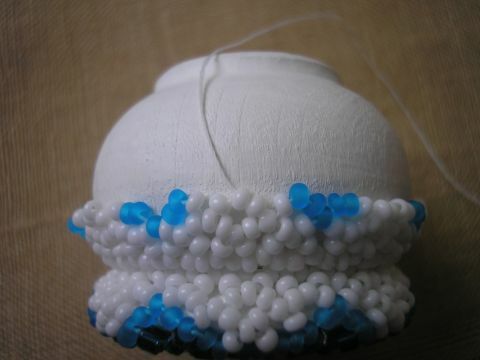 It turned out this way. 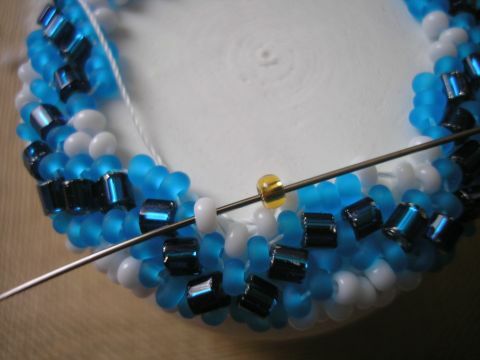 In this series, we subtracts beads. 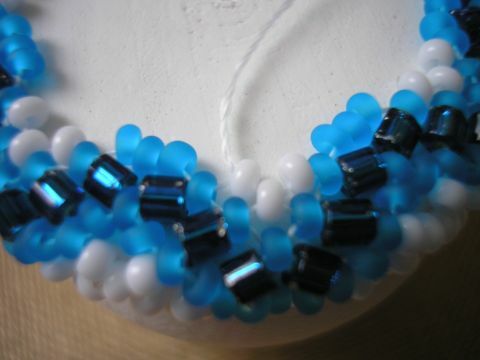 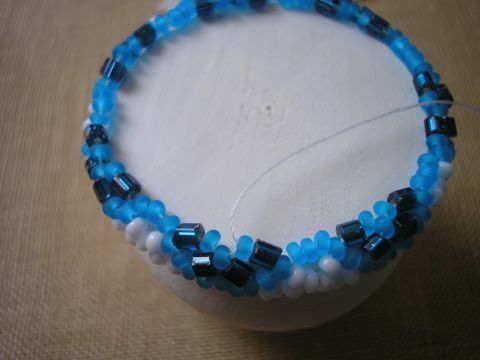 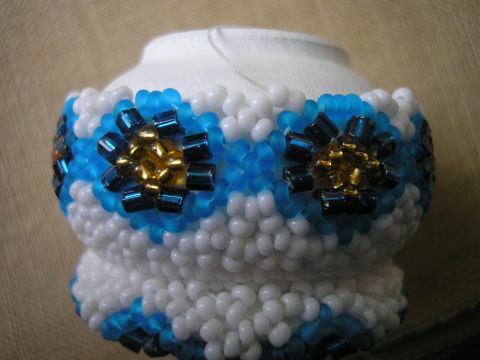 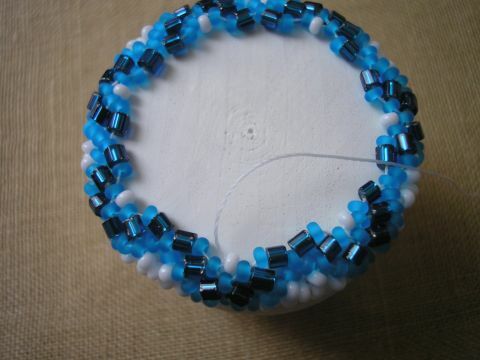 1 blue two beads. 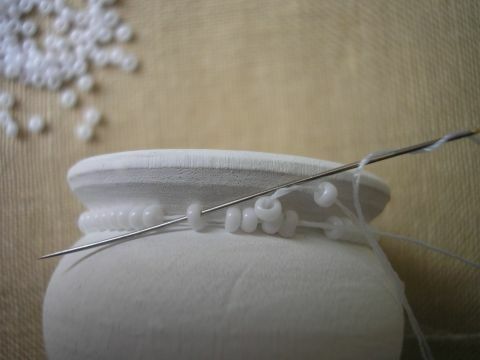 Season with a thread and cap ready. 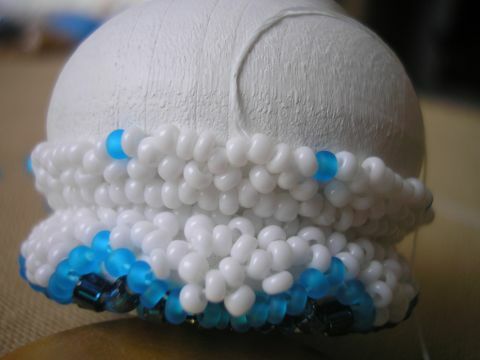 Proceed to the second part of the caskets. 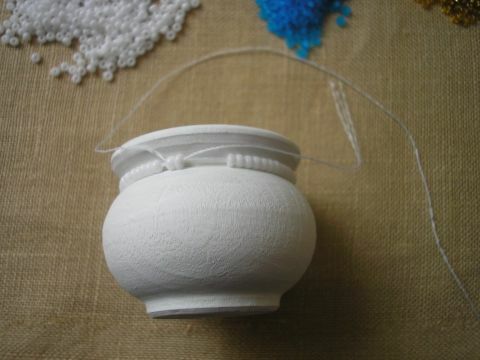 We work only with a closed casket! 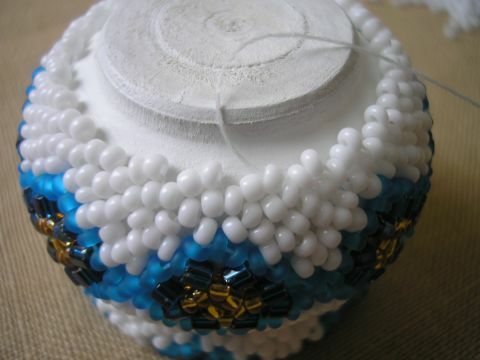 The beginning is the same as with a lid. 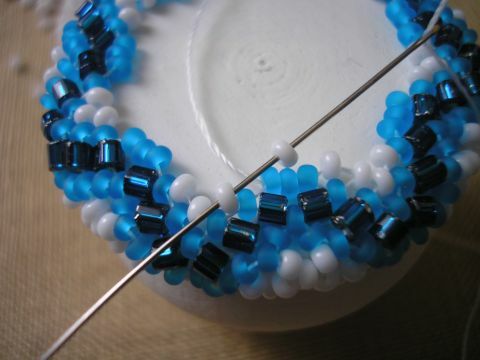 Recruit a number of beads to be divisible by three, but already more than caps.In this case, 72. 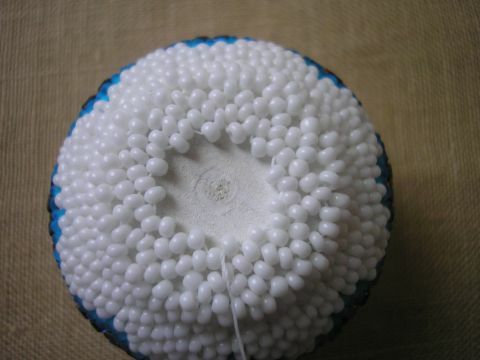 The first is the same as in the cap. 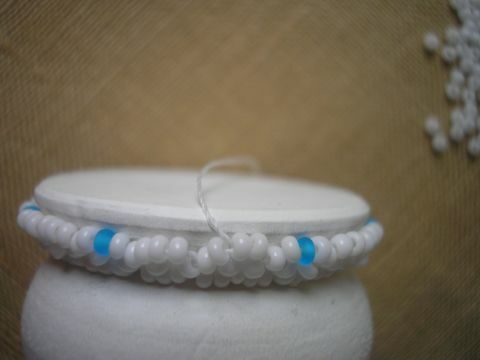 The first series is ready. 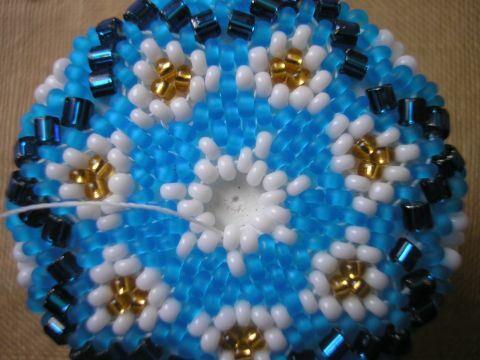 The second row of 3 white, 3 white, 1 white 1 blue 1 white. 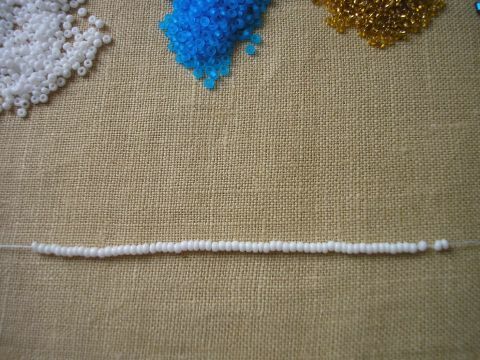 The fourth row is as follows. 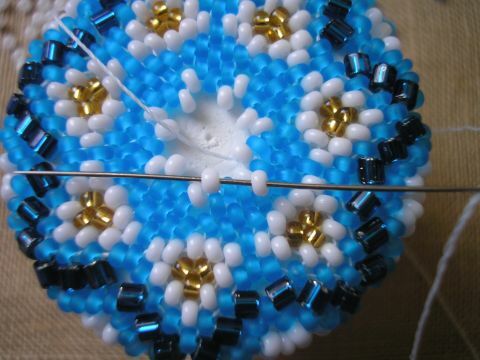 And it is the seventh row. 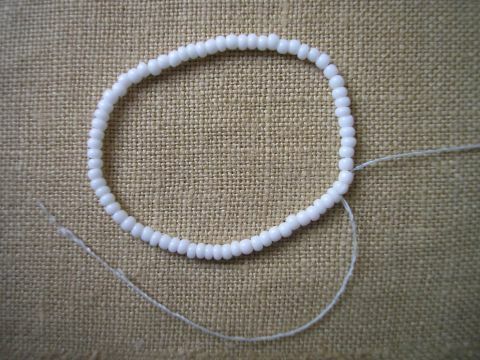 The ninth series of 3 white. 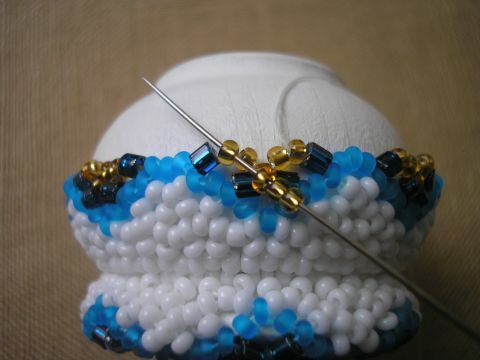 In the tenth and eleventh rows and 2 white. 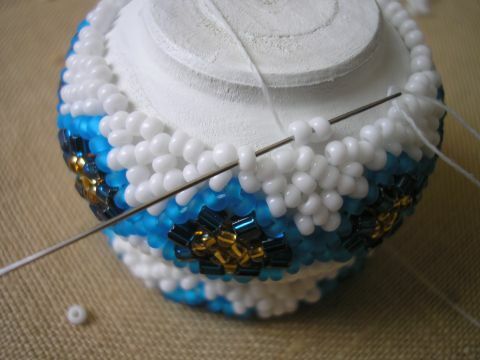 Next recruit one, we reach the bottom of the box. 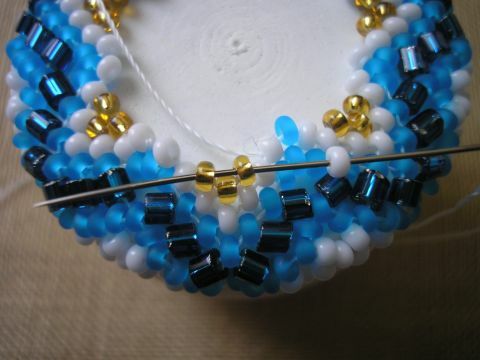 Bedplate doing so: 2 rows recruit three beads, next to 1 and begin to diminish beads.